Superconductors are materials which conduct electric currents without any resistance. 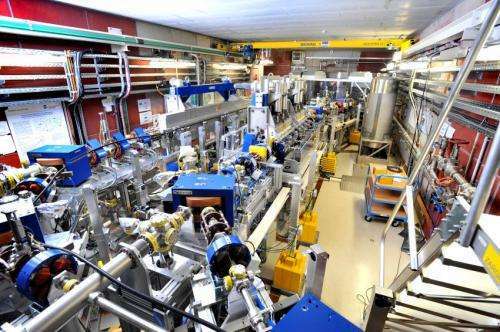 At the Helmholtz-Zentrum Dresden-Rossendorf, an international research team headed by Professor Andrea Cavalleri from the Max Planck Institute for the Structure and Dynamics of Matter managed to selectively influence this resistance-free conductivity with a powerful terahertz laser. This very precise laser light turns into a vortex which moves through the superconductor like a tsunami. The results will be published in the scientific journal Nature Materials. Typically, modern high temperature superconductors are solids which consist of a stack of thin layers, similar to the pages in a book. These layers are conductive and transport electricity. However, no electricity can flow from layer to layer at room temperature since those electrons which are responsible for the current flow can only move freely in the respective layer. If, however, such a layer stack is cooled to the right temperature, then superconductivity occurs along all directions. But there is one difference: While the electrons flow inside a layer without any resistance, these electrons can now also move from layer to layer by "tunneling" through the insulating areas located between these layers. Dr. Gensch explains: "Already the geometry suggests that the mechanisms of superconductivity are different inside and between the layers. We were interested in how the electrons transport this property vertically from layer to layer and/or whether we would be able to control this transport without disrupting the superconductivity in the horizontal layers." For their experiments, the researchers used one of the HZDR's two free electron lasers (FELBE) which generates laser flashes of a specific, freely adjustable wavelength between the infrared and the microwave range. If such a short terahertz flash penetrates the material layers of the superconductor at the right frequency, then it deactivates the superconductivity very selectively and locally by directly changing the tunneling properties of the electrons found between the superconducting layers. More precisely, the light generates a pair of normal-conducting vortex currents which rotate in opposite directions. These vortices then move through the superconductor with the light. A so-called soliton wave is formed. What's so special about these waves: They always retain their shape irrespective of any faults in the superconductor. This resembles the behavior of such known soliton waves as, for example, tsunamis; the shape of which is also not influenced by any ground dislocations or irregularities. In particular, the physicists expect a number of new applications from these light generated vortices inside superconductors. Since they move through the crystal just like a tsunami irrespective of any faults or irregularities, these vortices are perfectly suited to store and transport information inside them. Information is transported within DNA like soliton waves. The experiment, which furnished proof and demonstrated that the vortices can be controlled by laser light, has the physicists in Prof. Cavalleri's team already dreaming about new opportunities for information processing in superconductors. For a number of years now, intense pulses in the invisible terahertz range (0.1 THz – 10 THz) have been sparking enormous interest among scientists who investigate such so-called complex materials as high temperature superconductors. This is due to the specific properties of this long-wave radiation which has wavelengths between 0.03 and three millimeters. The energy per light particle is so low that the radiation doesn't really interact anymore directly with the electrons in a material, but instead, for example, with the atomic lattice. Sufficiently strong sources have been available for this purpose only for a couple of years now. The strongest terahertz pulses are generated by devices which are powered by electron accelerators. The AWT faction is going to love this one. Solitons are a natural consequence of non-linear systems. The vast sea of non-linearity that suffuses everything- looks a lot like an aether. An excellent observation-Non linear materials have the advantage. feasible direct applications- Vacuum-Arc Spots and seee if you can correlate to Sun-spots. need dimensional Modeling-see Space Cosmology Vedas Interlinks.